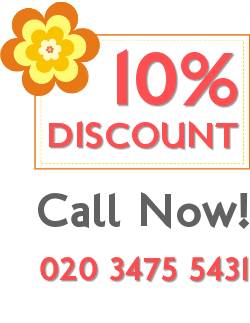 The most reputable cleaning company in London is providing top quality house cleaning services in the area of Royal Victoria, E16 at unbeatable prices. We are positive that even if you book a one – off trial procedure, you will become our regular customer as soon as you become aware of what our cleaning experts are capable of achieving. The cleaning visits will take place at a preferred to you time. You can even leave a spare key to your maid and enjoy the impeccable cleanliness when you come back home after a long tiring day at work. Contact us shortly. Q: Can I have a cleaning lady once fortnightly? A: The Regular Cleaning Services can be organised on both regular and fortnightly bases depending only on the personal preferences of the client. What's more, no matter whether you choose weekly or fortnightly bases, we can provide the same cleaning lady for each session. Q: I would like to know if the cleaning lady can put the clothes out on the clothing line. The clothes will be ready every time for her to take them out of the washing machine. A: Yes, she can definitely take the clothes and put the on the clothing line. Please be advised that the time for her to do this chore will be considered part of her cleaning time. Q: Can the cleaning lady use my detergents because my pet is very sensitive to most of the cleaning materials? A: You can definitely provide the cleaners with your detergents and equipment. We prefer this method in most of the cases because for us what matters most are the individual preferences of the clients. Q: Can the cleaning lady do only the hoovering, dusting and ironing? I do not want her to change the linen or do my ironing. A: The Cleaning lady always follows the list of tasks that you have provided her with. Ironing, changing linen and emptying bins are additional tasks that she will be happy to accomplish if you give her green light. House cleaning is importance for everyone and we are the cleaning services provider company which understands its importance. That’s why we are providing the best ever house cleaning services to all of the residents around Royal Victoria, E16, London with our professionally trained cleaners. We know that you have everything precious and expensive in your house and even if it is not so much expensive it still have worth for you. By considering this our workers work at your home with gentle care so you do not have to face any kind of loss or problem. You can contact us now to get the best ever cleaning services. Best Cleaners London is a company that promises its clients and customers to provide them best, regular, efficient and reliable house cleaning services, because the company is successfully providing this services to a number of clients from last many years. Most of the people complaints about the cleaning staff and the most importantly they quote that the cleaners are irregular and not punctual. But our company is strict about this rules and have directed to all of its workers and cleaners to not to be late at their duty. We are in those well known companies which are providing quality and responsible cleaning services in Royal Victoria, E16, London.